Join us EVERY FRIDAY at Lobo’s for Late Nights with Lobo. Every Friday we rotate between differently themed karaoke and trivia nights. Tonight is Pop Songs of the 2000’s themed. How well do you know your Musicals? Join us at Lobo’s for a night of rhythmical recklessness! Show off your voice for a chance to win prizes. Open Mic Nights occur every 3rd Wednesday of each month in Lobos. Sign-ups start at 7:30 PM, performances begin at 8:00 PM. Join us EVERY FRIDAY at Lobo’s for Late Nights with Lobo. 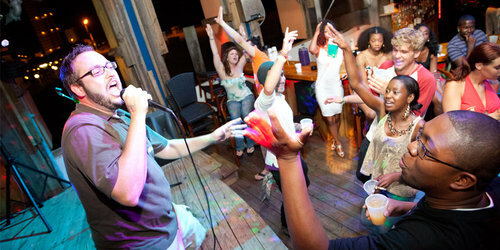 Every Friday we rotate between differently themed karaoke and trivia nights. Tonight is 90’s Sitcoms and Cartoons Trivia.